Nagpur: In what seems like a back-handed compliment, Congress president Rahul lauded Union minister Nitin Gadkari for being the only one in the BJP with “guts”. Soon after, as if laying a trap, Rahul asked him to comment on the Rafale deal, job crisis, farmers’ distress and destruction of institutions. Gandhi’s remarks came following Gadkari’s remarks that “one who cannot take care of home, cannot manage the country”. The minister hit back at Gandhi, saying he does not need a certificate from him on his courage and alleged that the Congress chief is taking the help of reports “twisted” by the media to attack his government. The Congress president cited a report quoting Gadkari as saying that party workers should first fulfil their domestic responsibilities as “those who cannot do that cannot manage the country”. “Gadkari Ji, compliments. You are the only one in the BJP with some guts. Please also comment on: The Rafale scam and Anil Ambani, farmers’ distress and destruction of institutions,” Gandhi tweeted and tagged with it the report on Gadkari’s comments. “Oops, Gadkari Ji. Huge apology. I forgot the most important one….JOBS! JOBS! JOBS! JOBS!” he said later in a tweet. The Union minister had made the remarks on Saturday while addressing former workers of the Akhil Bharatiya Vidyarthi Parishad (ABVP), the BJP’s student wing, in Nagpur. Gadkari took to Twitter to reply to the Congress chief. 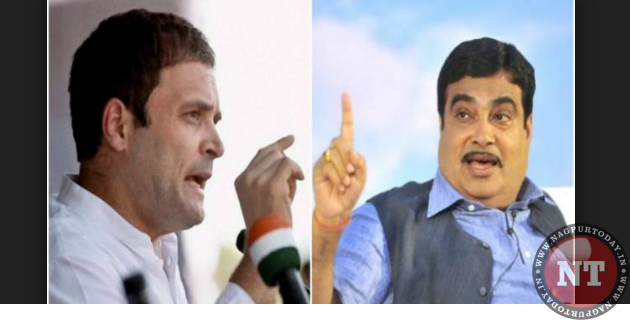 “Rahul Gandhi ji, I do not need a certificate from you on my courage, but it is a matter of surprise that even after being the president of a national party you have to take the help of news twisted by the media to attack our government,” Gadkari tweeted. The Congress chief’s comments praising Gadkari came in the wake of various other Congress leaders lauding the Union minister for his recent statements they view as a swipe at the BJP leadership. Congress spokesperson Manish Tewari had last week lauded Gadkari for his remarks that “leaders who fail to fulfil promises get ‘beaten up’ by people”, but at the same time took a swipe at him saying his target was Prime Minister Narendra Modi and his eyes were on the PM’s chair. In December, Gadkari had said at an event in Pune that leadership should have the tendency to own up defeat and failures. The remarks had come days after the BJP’s loss in Rajasthan, Madhya Pradesh and Chhattisgarh assembly polls. This Republic Day, Rahul Gandhi was seen exchanging notes with Gadkari while being seated along with him in the front row at the Republic Day parade at Rajpath.